The 30 mm caliber is a specific size of autocannon ammunition. Such ammunition includes NATO standard 30×113mmB and 30×173mm (STANAG 4624) rounds, Soviet 30×165mm, and 30x210mmB, Yugoslavian 30x192mm, Czechoslovakian 30x210mmCz, and NATO 35x228mm rounds which are widely used around the world. 30 mm ammunition is typically not used against personnel, but rather as an anti-materiel or armor-piercing round. Rounds of this size can be effective against armored vehicles as well as fortified bunkers. The Armed Forces of the Russian Federation use their 30 mm weapons in a variety of vehicles, including the Su-25 attack aircraft, Mi-24 helicopter, Mi-28 attack helicopter, Ka-50 attack helicopter, and the BMP-2, BMP-3, and BTR-90 infantry fighting vehicles. The most modern anti-aircraft gun systems in use by Russia are 30 mm. The U.S. military uses 30 mm weapons in their A-10 Thunderbolt II and AH-64 Apache helicopter. It was going to be used in the Expeditionary Fighting Vehicle until the project was cancelled. 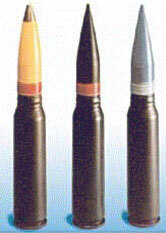 30 mm ammunition generally comes in three varieties: armor-piercing (AP), high-explosive (HE), and training rounds. 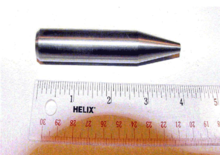 Armor-piercing and high-explosive cartridges usually also possess incendiary characteristics.